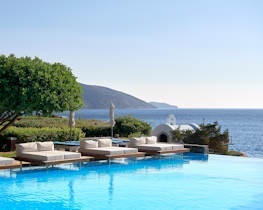 A Relais & Chateaux top quality hotel, Elounda Mare Hotel, exudes an air of exclusive tranquillity where cool beige marble, whitewashed walls and local pale coloured stone mirror the aesthetic traditions of the island. Built in the style of a Cretan manor, the hotel is set in beautiful gently sloping landscaped gardens leading to a private sandy beach. All guest rooms and suites in the main building offer wonderful sea views and each sea-facing bungalow boasts its own exclusive garden area and private seawater pool. The Deck, Yacht Club and Old Mill restaurants provide a wide range of dining options and gentle piano music can be enjoyed in the early evenings at the Karavia Bar with its magnificent views. For the second consecutive year, the Old Mill restaurant has received the prestigious Toque d’Or awards 2016 and is recognised as being one of the top Greek gourmet restaurants. Guests may use the facilities at nearby Elounda Peninsula and Porto Elounda Golf & Spa Resort which include a spa, a 9-hole par 3 golf course and children’s club. Minoan Knossos Royalty Suite Sea View is a two bedroom bungalow suite on the water’s edge with traditional architecture and extensive use of local stone and woodworks. 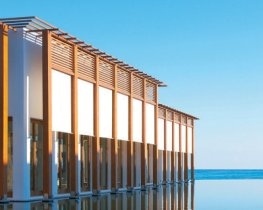 It provides a superb sea view from the private furnished garden and Private Seawater Pool. It has two luxurious en-suite marble bathrooms both featuring Airbath tubs, one with steam shower enclosure and the second bedroom has separate entrance and its own private terrace with a second swimming pool. Minoan Princess Adriani Royalty Suite Sea View contains two bedrooms joined by a spacious living room, all with superb views of the Aegean Sea and an extensive private terrace with panoramic view and a larger seawater swimming pool. Also it is made with traditional architecture and extensive use of local stone and woodworks. Minoan King Minos Royalty Suite Sea View is the top of the line bungalow suite containing two bedrooms joined by a spacious living room, all with superb views of the Aegean Sea and two luxurious en-suite marble bathrooms both featuring Airbath tubs, one with steam shower enclosure and separate toilet. A private fitness room with sauna and marble steam-room overlooking the Aegean sea and panoramic sea view from the extensive private furnished garden. Also a larger seawater swimming pool in the private garden. 1 complimentary lunch per person. for bookings made between 19 April 2019 and 20 October 2019 and arrivals between 19 April 2019 and 20 October 2019. Prices apply to all rooms. Honeymooners receive sparkling wine, flowers, room decoration, a cocktail each at the Karavia bar, and a Cretan traditional wedding present. for bookings made between 19 April 2019 and 20 October 2019 and arrivals between 19 April 2019 and 20 October 2019. Prices apply to all rooms.. Wedding Certificate must be presented upon arrival (valid up to 6 months prior to stay).